While I'm writing about Failbetter: Hot on the heels of completing the Song of the Sky in Sunless Skies, I finally achieved the last major milestone I've been tracking in Fallen London. I am now the proud owner of a Firkin of Hesperidean Cider! 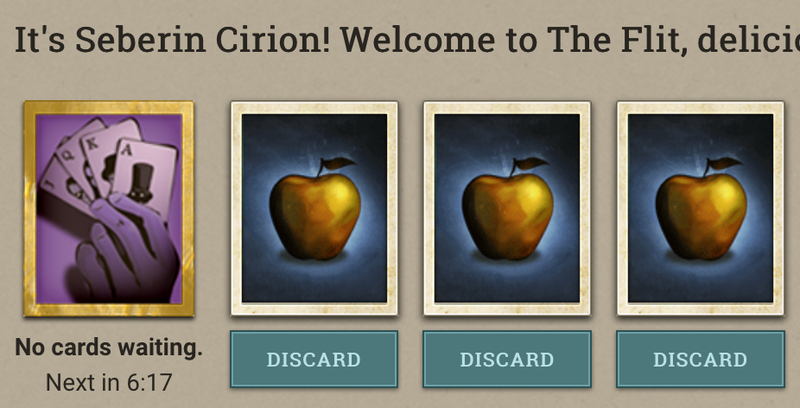 The game has grown significantly since I first started playing it about seven years ago, but Cider has been an end-game goal from the very beginning. The idea of ever obtaining it seemed ludicrous in those early days. The most expensive item in the Echo Bazaar, it cost a whopping 160,000 echoes, implying years of nonstop cash-grinding. It was always technically achievable - unlike many other elements of the game it was never locked behind content gates - which just made it the more tempting. The Cider makes you immortal. Both in the lore and mechanically within the game. 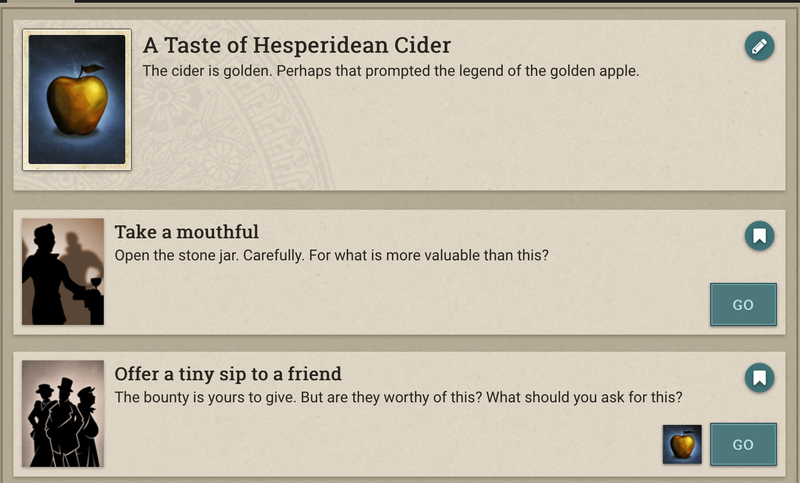 Story-wise, certain fruit elixirs can grant eternal life to those who imbibe. This is obviously evocative of the Tree of Life from the Garden of Eden, but the presentation in the game isn't specifically derivative of that. Interestingly, it seems that several different people have developed their own recipes over the years. The Capering Relicker came up with the original formula, drawing on Mesopotamian bounty. Millennia later, the Gracious Widow crafted her own version, a form of peach brandy with similar effects, enabling her to endure through the Khanate's exodus. Obviously, immortality is very tempting to any person at any time. It holds a slightly different appeal to those in the Neath. Shielded from the Sun's light and the Judgement's laws, those who live below the surface are effectively immortal already: they can survive stabbings and shootings and drownings and all sorts of deaths, picking their bodies back up and continuing on their way. But after experiencing such a death, they can never again return to the surface. The first rays of the Sun's light will re-establish the Law, and their belated death will catch up to them. My own character, Seberin Cirion, has always been a reluctant citizen of the Neath. There are marvels to see there, access to hidden wisdom that will fuel his goals. But he longs to feel the sunlight on his face again, to sit beneath the open sky, to lay on grass and see flowering plants once more. Because of this, during my seven-years stay in the Neath I've been very careful to avoid ever dying: I haven't paid any visits to the Slow Boat, and have relied on my Slavering Dream-Hound and other aids to keep my wounds in check. That said: now that I hold Cider, I can finally cross that final frontier without fear. I can explore that undiscovered country while retaining the ability to return to the surface. Whether it is Paris in 1906 or some other excursion at some other date, I can confidently leave the Neath once I have claimed what I need from it. Mechanically, the Cider is more complex and interesting than I would have imagined. I had vaguely thought that it might, like, give -8 Wounds when equipped, or let you drop wounds. It does the latter, and more, too. 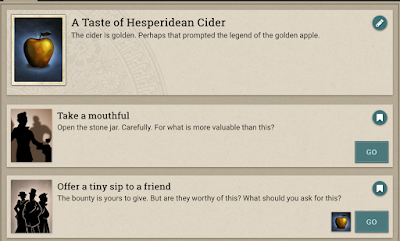 You can drink at any time by selecting it from your inventory. Doing so removes all of your Wounds in a single action... and also gives you 10 levels of a new quality, "A Taste of the Garden". Having these levels makes you eligible to draw new Dream opportunity cards. They are mechanically different from any other cards that I have seen: there is no "Perhaps Not" option to back out after clicking one. They behave like a mix between the red-bordered autofire dream cards and standard opportunity cards. 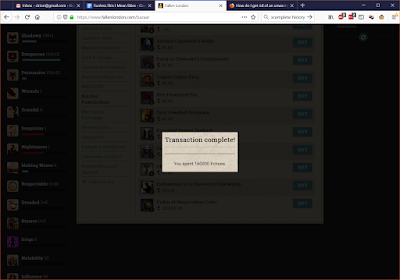 So far, all of the cards I've seen decrease "A Taste of the Garden" by 1, raise Nightmares by 1, and provide an Extraordinary Implication, worth 250 pence. I'm a bit surprised to see that owning Cider is itself profitable... but I guess that's how capitalism works! More seriously, this does lead to some genuinely interesting considerations for gameplay. You can drop Wounds on demand, but will effectively gain 10cp of Nightmares by doing so. You don't need to take those all at once, and they are fairly profitable to have, but you'll either need to spend future actions to manage them (and thus reduce the profitability of playing those cards), or else they effectively become menace cards. I am a Paramount Presence, fully overcapping all of my primary stats and achieving several distinctive goals. I have acquired all the best-in-slot gear (with the sole exception of the best Shadowy Boots, which I can finally claim in safety from the Slow Boat now that I have the Cider). I am the Poet Laureate of London. I have a Sealed Copy of the Crimson Book, which is clearly of enormous interest to the Bazaar. I have 0 Renown: Hell. Especially proud of that one! So, yeah! I think I'll park my character for a while - it isn't the first time, and won't be the last. There are a few exciting things on the horizon, like the completion of the Ambitions and the fourth tier of Professions, which I'm looking forward to playing once they're available. But most of the updates in recent years have been complete surprises, whether unexpected destinations across the Zee or new archaeological sites to dig up or new works of literature to create. 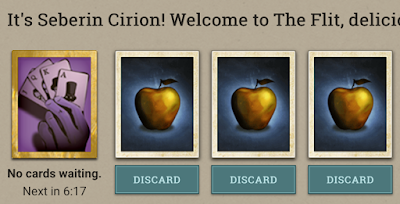 It's been really fun to see Failbetter expand into other regions and other modes of play in recent years, and it's also fun to still kind of have a home in Fallen London to which I can return now and then and enjoy the life I've built there.